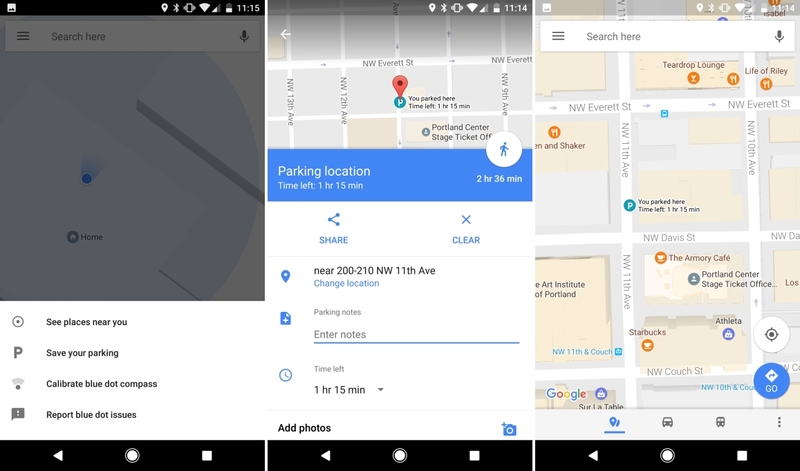 Earlier this year Google added a parking difficulty feature to Maps that let you know how hard it would be to find a spot at your destination. Now, the company is adding another parking-related feature, this time to make it easier to remember where you left your car. Available in the latest beta on Android, the new feature appears as a new menu option called "save your parking" when you tap the blue dot on the map. Pressing on it will save your current location and put a big "P" icon on the map, while you’re also given the option to enter notes and capture photos to help you remember the specific spot your car is in, as well as set a timer in case you’re on a meter. The time left is displayed on the map, and when it’s due to expire, Google Maps will alert you via push notification. Google Now already offers a similar feature that guesses when you’ve parked at a given spot by tapping into your phone’s sensors, though its automated nature means it sometimes saved your parking spot when you got off a bus or exited a taxi, for example. The new addition to Maps requires manual entry. Apple Maps has offered a similar feature since the release of iOS 10, which marks the location of your car with a pin when you disconnect your iPhone from Bluetooth or CarPlay. It’s a little more limited that Google’s version but it also offers the option to add notes and a photo.